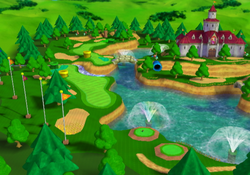 Peach's Castle Grounds is a playable course in Mario Golf: Toadstool Tour. It has a garden around Princess Peach's Castle with a statue of Toadsworth. Waluigi setting up a stroke on the third hole. This tournament is long and complex. It features high courses surrounded with lots of Out of Bounds areas, Flower Patches, and Bunkers. Tall mushrooms, Candy Canes and Warp Pipes are also seen here. If the golf ball lands in the pit with a Chain Chomp, it counts as an Out of Bounds. Also, there are fireworks on the last hole. If the ball lands on the Toadsworth statue, it counts as a "Rock" Out of Bounds. Strangely, if the ball lands on top of a Candy Cane, the player will still be able to take their next shot from on top of it but they will also be assessed a one-stroke penalty for a "Tree Hazard". The third hole of this course features a mountain which resembles Mount Rushmore, a real-life monument in South Dakota, with Mario characters taking the place of the various presidents. Princess Peach is in place of George Washington, Mario is in place of Thomas Jefferson, Luigi is in place of Theodore Roosevelt and Yoshi is in place of Abraham Lincoln. This page was last edited on November 10, 2018, at 09:59.